The astronauts aboard the International Space Station dimmed the lights, turned off unnecessary equipment and put off science work Thursday as NASA scrambled to figure out what's wrong with a key cooling unit. One of two identical cooling loops shut down Wednesday when the line got too cold because of a faulty valve. The system uses ammonia to dissipate heat from on-board equipment. Mission Control ordered the six-man crew to turn off some science experiments and other non-critical equipment; the powerdown continued Thursday. NASA officials stressed that the astronauts remained safe and comfortable. The suspect valve is inside an external pump that was replaced by spacewalking astronauts three years ago. 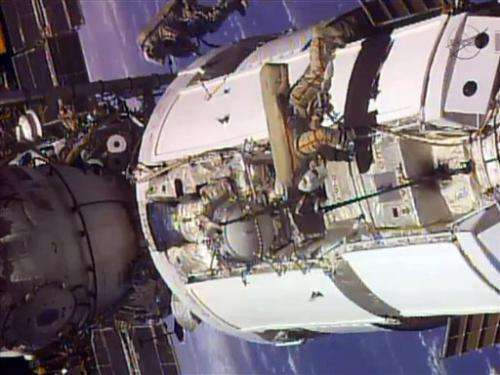 Flight controllers are looking at ways to fix the valve. A software repair would be the easiest option, a spacewalk the most complicated. In fact, three spacewalks were needed back in 2010 for the pump replacement. The valve can't be reached so the entire pump would have to be replaced with one of the spares at the space station. Kenny Todd, a space station manager, said the orbiting outpost is left "somewhat vulnerable" with only one good cooling line. There's always the possibility of additional failures, he noted, which is why Mission Control wants the problem fixed soon. Todd said it's possible that next week's launch of a commercial cargo ship, from Wallops Island, Virginia, may need to be delayed. Liftoff of Orbital Sciences Corp.'s unmanned Antares rocket, with a Cygnus capsule full of supplies and experiments, is scheduled for Wednesday. Space station managers will reconvene Monday to decide whether to delay the delivery mission. "At this point, for lack of a better term, we're going to kick the can for a little bit and go let the team work a little bit more," Todd said. U.S. spacewalks have been on hold since July, when an Italian astronaut almost drowned because of a water leak in his helmet. The problem was traced to the cooling system for his suit, but NASA wants the entire outfit returned to Earth before closing the matter. That won't happen until a SpaceX Dragon capsule is launched in February; it's the only cargo ship capable of returning items to Earth. Two Americans are aboard the orbiting lab, as well as three Russians and a Japanese astronaut.